Rating ~ 4 – 4.5 stars. 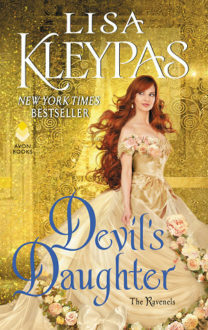 This book reminded me why I love Lisa Kleypas’s writing as well as why the wallflower series by her is one of my favourite historical romance series. I just can’t help it, all of the books I really enjoy end up having waffly and rambly reviews I just get too happy and excited to articulate properly. Lady Helen Ravenel is oldest of the Ravenel’s. The shy one and like her sisters naive about world in certain ways and of the other gender. She is very softly spoken, prefers her orchids than human company. Helen and her sisters grew up pretty sheltered but while the others were loud, mischievous and trouble makers, Helen was the opposite. We quickly find out why that is which made me feel sympathy for her. Helen goes through quite a lot in this book and comes out stronger and was great heroine. Rhys Winterborne of the Winterborne’s huge department stores is a man who came from no wealth and made a name for himself. While he may now have a great wealth and rubs hands with the nobility of the society he was not accepted by them. Which has greatly annoyed him in the past and he thought that marrying a noble would change that. He is arrogant but not in a obnoxious kind of way just in a interesting confident kind of way. And he is ahead of his time in having females in his employ for jobs that were male predominant at that time. He is a pretty great hero and a wonderful match to Helen. In the last book when Rhys was injured, Lady Helen took care of him and nursed him back to his health. And Rhys was captivated by the shy and softly spoken Helen. They were soon engaged after few weeks of courtship due to the machinations of Helen’s cousin and a kiss which left the naive Helen shocked. But due to machination of said cousins wife/her sister-in-law Kathleen dissolves their engagement much to the disappointment/hurt on Helen’s part and anger/hurt on Rhys part. Rhys thinks that Helen didn’t want to marry him because he was a common born, came to her senses and he is pretty growly and miserable at the start of the book. I was pretty angry at Kathleen of what she did to them in the last book, I mean she refused to listen Helen and about what she wanted instead just did what she thought was best but this lead to Helen becoming her own woman and speaking out and doing what she wanted which is guess made it more than okay. The first scene of them together in the book was swoon worthy with Rhys angry/jerkish and Helen trying to overcome her natural shyness to tell him that she still wants to marry him and what follows *HAPPY SIGH*. Helen wanting them to wait 5 months for their wedding allowed them to get to know each other quite well, with Rhys impatient for his bride and of course allow conflicts to rise up. Rhys and Helen were so adorable together. Rhys had really come to really feel for Helen but obviously he didn’t think of it that way nope he was just angry that was it not hurt or love at all at the start of the book. So when it seems Helen does want to marry him he wants nothing to get in his way. He was so lovely and gentle with her while with others he is gruff and seems to only think of business and reputation. Helen finds out a secret that could end her engagement but not wanting to hurt Rhys, decides he might be better off without her. And what he does at the end for Helen is romantic and sweet and ahhh they are lovely together. They had great chemistry which is evident from their first scene in the book. Quibbles: The ending was a bit rushed and I wished that the author hadn’t spent so much time on the conflict bit because those chapters had no sign of Rhys in them but had so many other characters. The series has so many intriguing characters from Helen’s other cousin West, to Winterborne’s female doctor Dr. Gibson to Rhys genius friend and the twins Pandora and Cassandra of course. I want all of their books. The story has some pretty great character development for both Rhys and Helen and book left with a happy satisfied feeling you can only get with a job well done in romancelandia. So I’ll probably go read the Devil in Winter again for nth time and daydream about Devil in Spring. That is all! Happy Reading!